Until you can actually experience all the Roanoke Valley in Virginia&apos;s Blue Ridge has to offer, take a look at our most photographed sites. Images are available free of charge for editorial usage for media, meeting planners and travel trade professionals. Photo credit is required to be placed adjacent to any use of our photography. Due to copyright restrictions, these images may be used only for editorial purposes. Photos are to be used solely for NON-COMMERCIAL purposes in promoting Virginia&apos;s Blue Ridge as a visitor and convention destination. Usage is granted for one-time, non-exclusive reproduction rights to the images made available in the Media Gallery hosted on this website. Terms of Loan: Upon approval, you are required to include all necessary photo credit information for each image used. If an image is used for a web article, you are required to include a link to the Visit Virginia&apos;s Blue Ridge website - www.visitvbr.com. It is requested that the user send the Visit Virginia&apos;s Blue Ridge two free copies of the print publication and any website links of where the photo appeared. NOTE - PROPER PHOTO CREDIT IS REQUIRED FOR EACH IMAGE USED. If you&apos;d like to use additional images in your stories about the region, please contact Taylor Spellman, Public Relations Manager, to place your image request. We appreciate your interest! Use of this photo must be approved by the Roanoke Valley CVB. 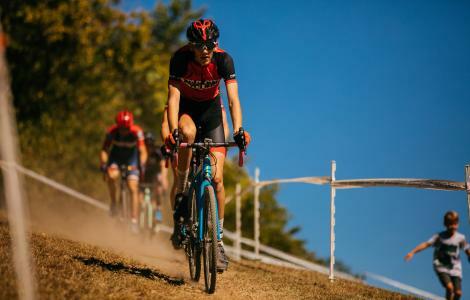 Riders of various ages and skill levels compete in the Go Cross Cyclocross races in Virginia's Blue Ridge.